Is there more to the Rock than its tax free benefits? Yes. 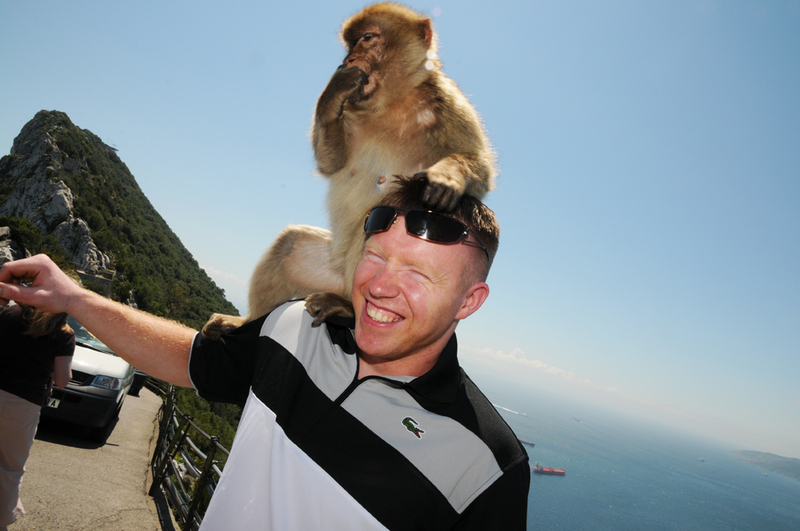 Gibraltar is one of those places that is all about multicultural diversity. There are roughly thirty thousand inhabitants, and they are a mix of Catholics, Protestants, Muslims, Jews and Hindus. Together they live side my side, most of the time actually on top of eachother… (remember, Gibraltar is only seven square kilometers, or 5.8 square miles for those of you think like that) Yet, religious tensions are unheard of. 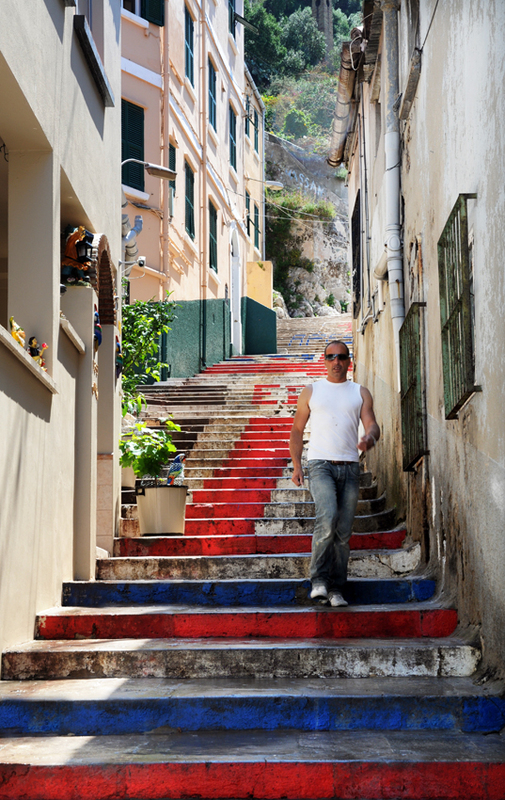 The Union Jack steps date back to 1967, and are a constant reminder of Gibraltar's British identity. So. 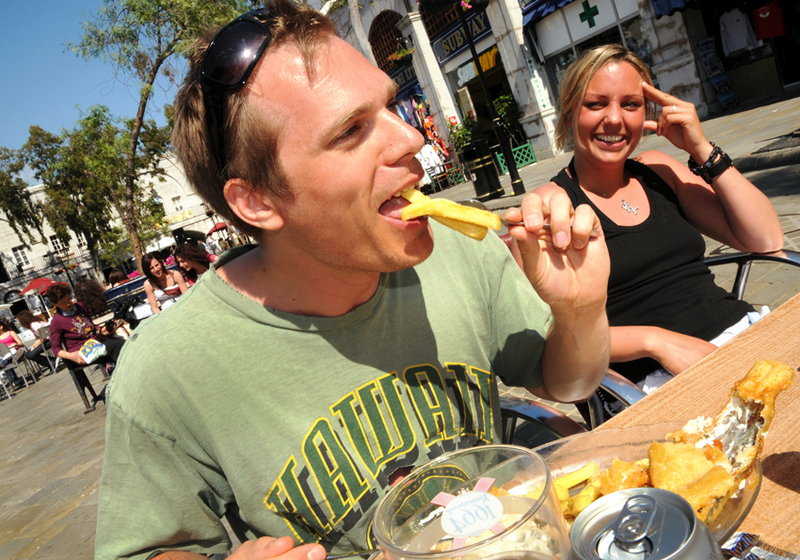 Don’t frown upon the commercialized Main Street where most tourists end up. If you manage to see beyond the tax free tobacco and spirits, the toy monkeys and other tacky souvenirs, chances are Gibraltar will teach you a valuable lesson about tolerance and integration. The best news is that this lesson is for free, NO hidden costs. Catch an authentic glimpse of Gibraltar’s Jewish community on a Saturday afternoon. The Jews are not allowed to do ANY kind of work during Sabbath, so you’ll catch them simply strolling about with their families. You’d be forgiven for thinking that you were in Jerusalem rather than in this tiny, British peninsula clinging on to the southern tip of mainland Spain. Most Saturday afternoons there is also a traditional, Catholic wedding in the Cathedral in Main Street, so you can soak up two religions at once. Gibraltar was once connected geographically to the African continent. This explains why the tail-less ape known as the Barbary Macaque is still thriving on the Rock. They are Europe’s only wild apes, and a face to face encounter is naturally free of charge. There are five packs of apes on the Rock, two of them interact with tourists on a daily basis. You may choose to go on an organized taxi tour where you’ll be sure to see the taxi driver handle the apes as if they were family members dear to him. However, the apes are happy to interact with anybody that shows them a bit of interest. Make your way up the Rock, and you’ll be sure to be rewarded with close contact. If partying all night long is your cup of tea, then make sure to be in Gibraltar on the 10th of September. It’s Gibraltar’s National Day, when the local population – all thirty thousand of them – dress up in red and white. Gibraltarians are fierce nationalists, and they will go out of their way to state that they wish to remain British. Party with the Gibraltarians on the 10th September. Gibraltar used to be part of Spain until it was taken by the Brits in 1704. Three hundred years on, the Spanish are still trying very hard to get it back. Their methods are sometimes diplomatic, but most of the time they are of a less democratic nature like constructing huge queues at the border between Spain and Gibraltar. Thus preventing the free movement of people. This is a complex issue which you will definitely hear more about if you hit Main Street on the 10th September. Let yourself be swept away with the patriots and indulge in feeling like a red and white Gibraltarian for a day! According to ancient Greek mythology the Pillars of Hercules are the two mountains that mark the entrance to the Mediterranean. The Rock of Gibraltar is the northern pillar, and Djebel Musa in Morocco is the southern pillar. The pillars were referred to as ‘NON PLUS ULTRA’ or ‘nothing further beyond’ in the times of the Greek and the Romans. This once indicated the end of the world as the Greek knew it. It was considered dangerous for sailors to continue through the straits of Gibraltar, and today the impressive view of the Atlantic ocean gushing into the Med is still breathtaking. Get down to Europa Point for an undisturbed and completely free of charge view. Unless of course, you decide to slot a coin into the fixed binoculars available. Gibraltar is full of evidence of its British identity and military history. Bobbies patrol the streets, double deckers take tourists from the border to the town centre and you’ll be served a top notch fish n’chips in Casemates square. Fish n'chips for lunch. If it wasn't for the sunshine, you'd be forgiven for thinking you were in the UK. Keep your eyes open for more subtle signs of Britishness such as the red letter boxes, the way the locals will refer to you as ‘darling’ and the authentic cream tea served up at the English tea room. There’s even a Marks & Sparks, a Top Shop and a BhS for some authentic, British retail therapy. 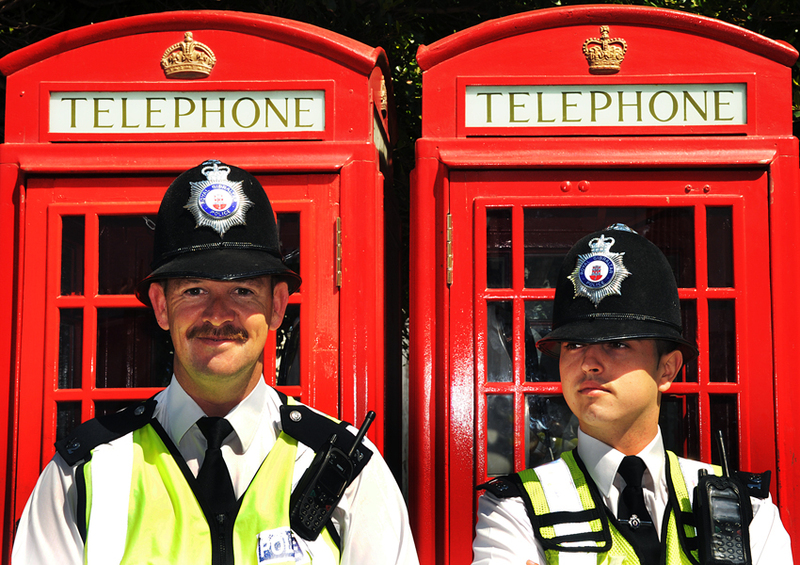 British bobbies patrol the streets with a smile. Forget overpriced yoga classes and tune into the real deal Hindu style hatha yoga. The Integral Yoga Center in Gibraltar is the place where Gibraltar’s Hindu community gather to do their yoga routines, and there are regular classes where it’s free to participate. It’s a pay what you can/feel like arrangement, exactly the way the yogi philosophy intended it. For more information check out Yoga Gibraltar. Gibraltar has a big and very dedicated yogi community. Gibraltarians have perfected the art of beach bumming! The Rock is surrounded by an exciting coast line where you can find six beaches of very different character. Forget everything you’ve ever learnt about Mediterranean beaches, because in Gibraltar there are no rental umbrellas or deck chair service in sight. Very few tourists spend time on the beaches, so you are guaranteed to be surrounded by locals. Beach bumming is the best thing to do on a hot summers day. These guys are enjoying Camp Bay. Parking is always an issue in Gibraltar, but the local bus system criss crosses the whole of the Rock. Bus number 4 serves all the beaches below apart from Wester Beach. 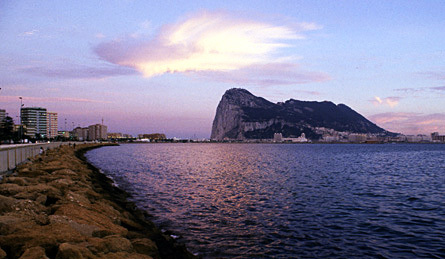 Eastern Beach – is Gib’s biggest beach. A mass of sand a sea where the sun doesn’t go down until late. Beach bars and people watching are key words. 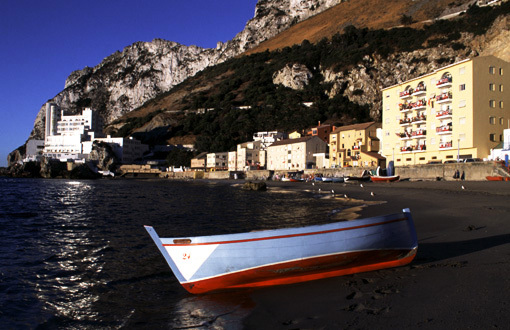 Catalan Bay – (see picture below) is nestled below a quaint little fishing village on the Eastern side of the Rock. This area is also called La Caleta, and its inhabitants claim that they are of different origin than the rest of Gibraltar. The beach is a cove of soft sands, and the sun dips behind the top of the Rock at around 5 pm. One English pub (the Seawave) serves up a decent lunch and a cooling pint of whatever you like in your glass. Sandy Bay, also known as Both Worlds – is still on the Eastern side of the Rock, and is another stretch of soft sand. Very picturesque because you can spot both Africa and Spain, thus the name Both Worlds. Little Bay – is a rocky bay on the Western side of the Rock. This place is more sheltered than the Eastern side, so expect comfortable conditions even if it’s rough and wavy on the other side. Don’t forget your swim shoes though, because it’s full of little pebbles. Camp Bay – (see picture above) is a man made place on the Western side of the Rock where cement terraces form the basis of where people sit. Many Gibraltarians insist on coming here, simply because they are sick and tired of the sand, and because there is a small salt water pool for kids to play in. Western Beach – is Gibraltar’s funniest beach. It is located right next to the runway, so you can combine plane spotting with a dip in the sea. Not my cup of tea, but is does somehow sum up how everything in Gibraltar seems to be located on top of each other. Catalan Bay is one of Gibraltar's most charming spots. 1 – Neanderthal or not? There’s no better place to learn about Gibraltar’s unique history than its cute, little museum at number 18, Bombhouse Lane. Admission is only £2 for adults, and you’ll see a film about how the peninsula moved from being attached to the African continent to becoming part of the European continent. You’ll also see a copy of a Neanderthal skull which was actually discovered in Gibraltar’s Gorham cave eight years prior to the skull found in the Neander Valley near Dusseldorf. In other words, what might have been the Gibraltar man became what the world knows as the Neanderthal man. Due to Gibraltar’s ethnic diversity, you’ll be able to pick up anything from a kosher shawarma to a crunchy, Moroccan pastilla. Check out the take away kitchens along Watergardens and don’t miss ‘Solly’s’ at number 8, Cannon Lane. It’s a favourite amongst the locals! 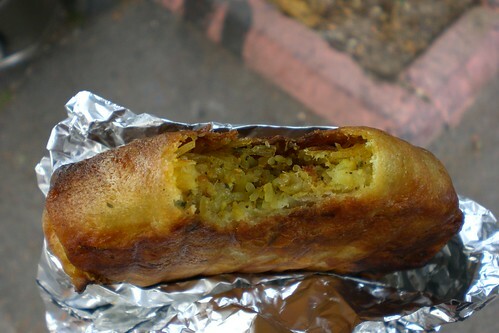 This is Moroccan pastilla, originally made with pigeon meat, but modified to contain chicken. 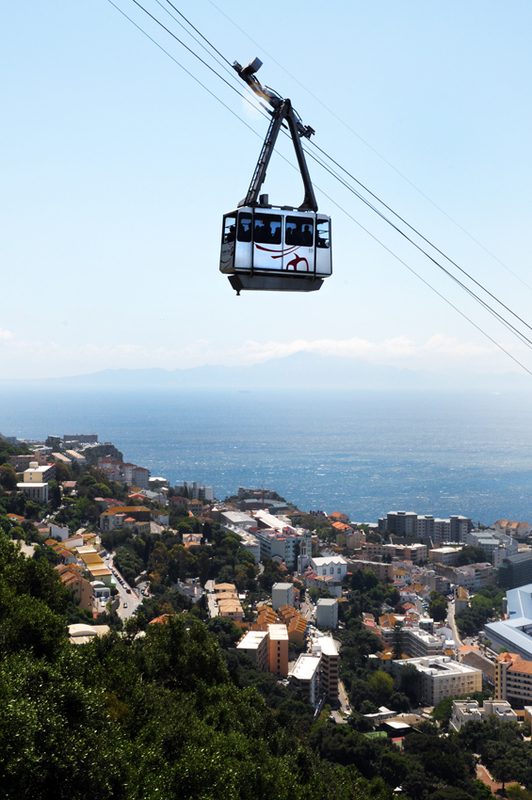 The Cable Car is a great way to reach the top of the Rock. It runs every day between 9.30 and 17.15, providing the winds are modest. It’ll take you from the car park at the end of Main Street to the top of the Rock. The cost is £8 return per person for the cable car ride alone. This will simply drop you off at the top of the Rock and there you will be left to your own devices. There will be apes to see, but the museums and caves are not included in the price. If you fork up £16 return, you’ll get the cable car ride as well as admission to the St Michael’s Cave, the Great Siege Tunnels, the Moorish Castle, our City Under Siege Exhibition and the 100-ton Gun. Consider it money well spent to get to know Gibraltar inside out. Fancy reading about the world’s most beautiful woman? She’s Gibraltarian, and she’s neither blond nor stupid. Her name is Kaiane Aldorino, and we have written about her here. Norwegian newspaper VG commissioned us to do a piece about Gibraltar last year. Spencer went along with our brand new Nikon D300 and re-visited old favorite hang outs of his. Needless to say, he was trigger happy, dying to test out new functionality. So he came back with triple the amount of images needed for the article, and this is one of them. It was taken in Rosia Bay on the Western side of the Rock of Gibraltar. The beach is man made nestled below an old military battery. The boys had managed to convince their mums to take them to the beach although it was not yet summer holidays, and therefore the beach was almost empty. I love the way the boys spontaneously struck these body building poses as if it was the most natural thing in the world. And I love their shadows.